Care, patience and time have transformed a neglected and emaciated two-year-old filly into a national award winner. Despite the worst start in life, By the Grace of God, a chestnut mare owned and ridden by Victoria Whitehead of Tuskegee, Alabama, was named the 2018 winner of the North American Trail Ride Conference’s President’s Cup, at the organization’s national convention in Reno, Nevada, last week. 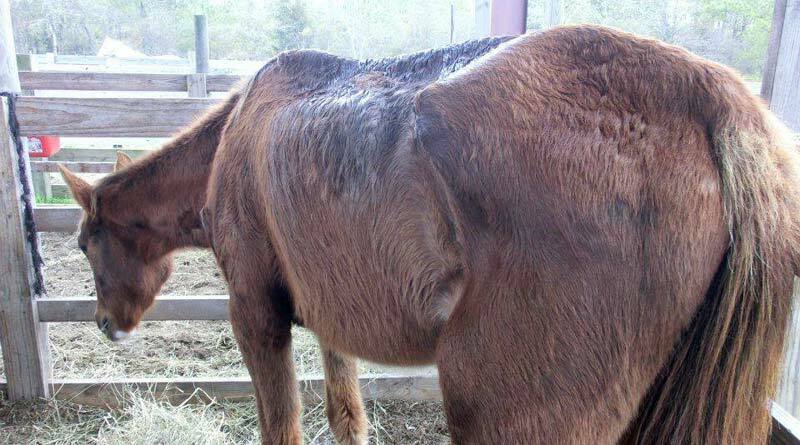 Grace’s remarkable turnaround started in 2012, when Whitehead found her as “a walking skeleton” in a pasture with no feed. She was covered in rain rot. Grace was taken home by Victoria Whitehead in February, 2012. “She was so emaciated that when I went to catch her, she didn’t even bother walking away,” said Whitehead. She named the two-year-old “By the Grace of God” because of her faith in God. The pair spent the next three years working on trust, including lots of groundwork, and rebuilding Grace’s health. At just six weeks under saddle, Whitehead decided to enter a NATRC competitive ride. It was to be Grace’s first competition, and her rider’s second. Whitehead describes the event in a single word — “disaster”. Regardless, she took it as a sign to persevere with Grace and NATRC competition. Owner Victoria Whitehead says Grace was a “walking skeleton” when she found her. “Because spirits are easily broken on the ground and it is the act of getting up that gives us strength, I realized NATRC was exactly what both this filly and I needed,” Whitehead said. “I have never been one of those hard-core competitors, riding for points and glory. My competition has always been within myself. Do my best, have fun while I’m doing it and the rest will work itself out,” she said. After more than 10,000 miles of trailering to different states and regions to compete in 16 NATRC rides, they did land in the stars. Together, Whitehead and Grace earned her region’s heavyweight top award, top national honors in NATRC for overall heavyweight horse, overall heavyweight horsemanship, the overall combined horse and horsemanship award, a national championship and the high point grade horse award. Capping off the incredible year came in the form of the 2018 President’s Cup, NATRC’s highest recognition for horse and rider. “I do not accept this award just for Grace and me. I accept it for my whole family — my family at home, Zeb and Zayne, my NATRC family, and my barn family,” said Whitehead as she accepted the President’s Cup in Reno. Grace is such part of the family now that Whitehead’s two-year-old rides along with mum in a “buddy seat”. Grace is a beloved member of the Whitehead family.